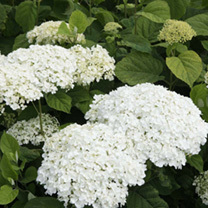 Hydrangea arborescens Strong Annabelle is also known as Incrediball. A recently introduced variety, which has eye-catching really large ball-shaped flowers (up to 30cm in diameter) which cover the plant over an extended period from mid to later summer. It was bred to develop strong stems to support such large flowers and therefore be an improvement on a number of its predecessors where sometimes the stems can bend or break due to the flower size. 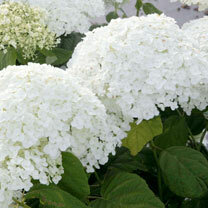 Therefore larger flowers and stronger stems! Flowers June-September. Height 150-200cm. Supplied in a 3 litre pot. A wonderful hydrangea which will fit into almost any garden situation. Included are some of the newest varieties on the market, from top breeding programmes, to bring to you the very best genetics, and therefore performance, in your garden.